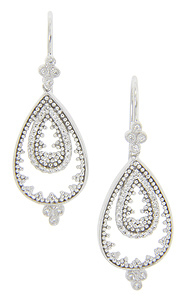 Diamonds adorn these 14K white gold antique style earrings. Gold bead work provides additional ornamentation. The earrings measure 1 1/2" in height by 1/2" in width.